Practical life materials and exercises respond to the young child's natural interests to develop physical coordination, care of self and care of the environment. Specific materials provide opportunities for self-help dressing activities, using various devices to practice buttoning, zipping, bow tying, and lacing. Other practical life materials include pouring, scooping and sorting activities, as well as washing a table and food preparation to develop hand-eye coordination. These activities also provide a useful opportunity for children to concentrate bringing about their normalization. Other practical life activities include lessons in polite manners, such as folding hands, sitting in a chair, and walking in a line. The sensorial materials provide a range of activities and exercises for children to experience the natural order of the physical environment, including such attributes as size, color, shape and dimension. Many of these materials were originally suggested and developed by Seguin in his prior research with scientific education. In this area, materials are provided to show such basic concepts as numeration, place value, addition, subtraction, division and multiplication. For numeration, there is a set of ten rods, 1-10, with segments colored red and blue and “spindle boxes”, which consist of placing sets of objects in groups, 0-9, into separate compartments that provide both a visual and tactile demonstration of the value of zero. For learning the numeral symbols, there is a set of sandpaper numerals, 0-9. For learning addition, subtraction, and place value, materials provide decimal representation of 1, 10, 100, 1000, etc., in various shapes made of beads, plastic, or wood. Beyond the basic math materials, there are materials to show the concept of fraction, geometrical relationships and algebra, such as the binomial and trinomial theorems. In the first plane of development (0–6), the Montessori language materials provide experiences to develop use of a writing instrument and the basic skills of reading a written language. For writing skill development, the metal insets provide essential exercises to guide the child's hand in following different outline shapes while using a pencil or pen. For reading, a set of individual letters, commonly known as sandpaper letters, provide the basic means for associating the individual letter symbols with their corresponding phonetic sounds. Displaying several letters, a lesson known as the "Seguin three-period lesson" guides children to learn the letter sounds, which finally blend together to make certain simple phonetic words like “up” and “cat”. The aim of these nomenclature lessons is to show the child that letters make sounds, which can be blended together to make words. The Montessori language materials have been developed to help children learn grammar, including parts of speech, such as nouns, verbs, adjectives, articles, prepositions, adverbs, conjunctions, pronouns, and interjections. 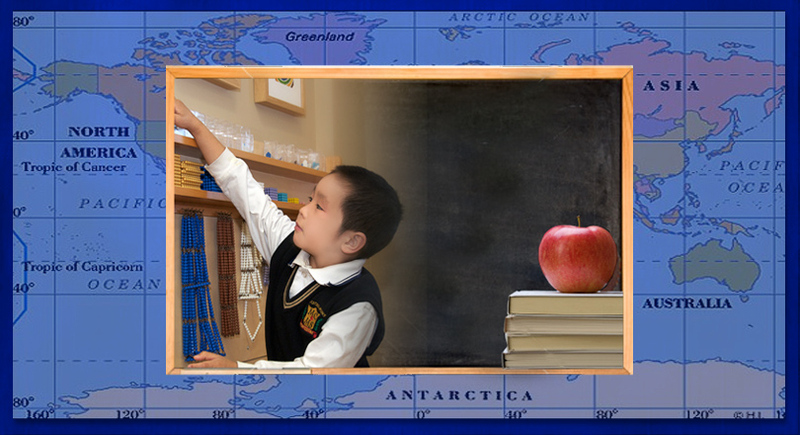 The Montessori classroom may also include other materials and resources to learn cultural subjects, such as geography (map puzzles, globes, cultural suitcases containing country-specific materials), and science, such as biology in naming and organizing plants and animals. Music and art are also commonly involved with children in various ways. These learning resources include reading books and more abstract materials for learning a broad range of advanced subject matter. Students will continue to learn basic oral skills. They will also be introduced to the written language, using workbooks and learning the alphabet, parts of speech and common expressions as well as applying their knowledge to participate in conversation. The curriculum will also teach the students numbers, colors, days of the week, months of the year, as well seasonal themes will be introduced to help label and identify everyday life experiences. Students will be introduced to reading and singing musical notes, rhythm and counts of various beats. Music history, famous composers and music around the world is also explored. They will also be introduced to musical instruments, such as the Glockenspiels, bells and melodic instruments. Active musical training can improve their problem-solving skills, physical coordination, poise, concentration, memory, visual, aural and language skills, and self discipline. It fosters self confidence and improves the ability to learn. The students are given the opportunity to discover their creativity and express it through our hands on program that benefits children’s problem solving and creative skills, which will increase their self esteem and improve achievement in other learning areas. The students will have the opportunity to participate creatively in visual arts thru different types of media, different art techniques and design. They will also appreciate artistic expression, and to expand individual imagination and of course have fun! Students enjoy physical education in our multi-purpose gymnasium and outdoor actives in our beautifully equipped playground. Students are given the opportunity to demonstrate their achievements in motor development, inhibition of movement and introduction to organized games. The physical education program also encourages sportsmanship, cooperation, learning the rules of various games, specific sport skills and teamwork. This area will also cover Health and Nutrition. The students will improve the three key elements, endurance, strength and flexibility.